Find best inversion chairs & tables. You’ve probably heard before that you should stretch before you exercise. It increases flexibility and reduces the risk of energy. But does that mean that prior to exercising is the only time you should stretch? Absolutely not. Regularly stretching can have numerous benefits for various parts of the body. One of the most important areas that you should be stretching is the back. There are many great advantages to using a vertical back stretcher. You can do so in the comfort of your own home and your back is going to feel so much better. You’ll also save on chiropractor fees if you have your own back stretcher at home. Some insurance plans may actually reimburse you for purchasing one of these back stretchers. When it comes to back stretchers, there are a few different types. You can choose from the different types according to your own personal preferences. You can either choose the hang upside down type or you can choose an inversion type back stretcher. Depending on your level of fitness, you may wish to choose one of the following back stretchers. Both have their own advantages and disadvantages. Let’s examine them in more detail and see what others like and dislike about each model. 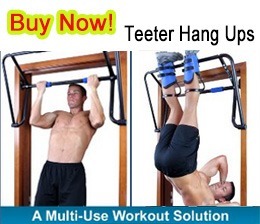 This back stretcher, by Teeter Hang Ups, is an easy to use system. It requires a rack and gravity boots and readily attached to a door frame. It also comes with its own DVD that will walk you through each step of the process so that you understand how to properly use it. You’ll learn how to set yourself up to use this model easily by following the enclosed instructions. It can attach securely to any door frame. You then put the special gravity boots on and hang upside down. 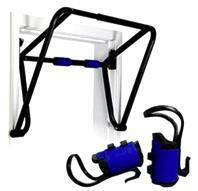 You can also use this model to do chin ups and work on your upper arm strength. According to users, this may be a bit painful in the beginning, but you’ll feel instant results when you choose this method. You’ll save money by not having to go to the chiropractor as often. This unit is under $200 and very affordable when compared to a co-pay to the chiropractor over the course of a year. It will quickly pay for itself. The gravity boots are uncomfortable. The gravity boots are a “one size fits all” so if your feet are very large, or very small, you’re going to have a serious issue using these. You have to be in good enough shape to “walk” your arms up to the sides and hang upside down. You’ll need a drill to install the mounting hardware securely to your door frame. May not be suitable for older persons who have lesser arm strength. Many have complained about their customer service should you have any issues with the equipment. Your door frame may not be sufficient to hold heavier weights. Always ensure that you’re using a door frame that can support your weight. 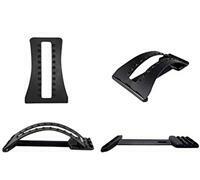 This set has Adjustable Frame fits doorways from 28 – 36 inch wide and features comfortable foam grips. Lightweight, but highly durable material, each boot weighs just 2 lbs. Optional Calf Loops wrap behind each leg to place a 2 degree bend in the knees. REALLY a fantastic decompresses product valued to buy! The inversion back stretcher relies on a “table” in lieu of a door frame. This makes it slightly more favorable to those who aren’t in “good shape” or who can’t use their upper arms due to lack of muscle tone or other issues. In just a few minutes each day, you can relieve back pain without having to leave home and pay for a chiropractor. You can easily use it regardless of your age or level of fitness. No requirement for upper arm strength to “climb” up the unit. Simply lay down on the table, lock your feet into position and gently maneuver the table back to a fully inverted position. It supports up to 350 pounds of weight. Sturdy construction of tubular steel frame. The backrest is made of memory foam so it’s very comfortable. The ankle rests are ergonomically molded for extra comfort. This unit requires some space to leave it when not in use, however, it does fold in half. This unit can’t sit too close to a wall or other furnishings as you must be able to rotate it over backward. 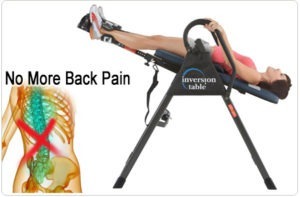 If you’re too short, you can’t use this inversion table as you’ll be unable to “lock” your feet into position safely. It weighs almost 80 pounds so it may be challenging for some to move it around if it needs to be pulled out from a wall. This Ironman inversion back stretcher only sales above $200, depending on if you have it shipped assembled or assembly required. You can have it shipped assembled so that you don’t have to put it together. If you do choose to assemble it, it’s very easy to assemble following the instructions. This is the most selling back stretcher in the market, have more than 2 thousand Top 5 star reviews on amazon, you will not go wrong with it! Properly stretching the back on a daily basis can have a profound impact on the body. Let’s look at a few of the different benefits associated with stretching the back. Benefit 1: Reduce The Risk Of Back Pain. As a matter of fact, not only can stretching reduce the risk of experiencing back pain, but it can also help reduce existing back pain. Lower back pain is a problem that millions of people suffer from on a daily basis. In some cases, it can be so extreme that it impairs their normal lifestyle. Finding a reliable solution can be difficult without a way to diagnose the cause. Use an anti-gravity back stretcher is a great preventative measure you can take to ward off potential sources of back pain. It will reduce daily stress on the back, increase the flexibility, improve strength, and reduce the possibility of pain from muscle memory. Overall, stretching is one of the best ways to prevent back pain. Benefit 2: It Increases Flexibility. This was touched on briefly already, but let’s look at it in a little more detail. Flexibility is a term that refers to the degree with which a muscle can lengthen. Babies have the best flexibility of us all. Unfortunately, as you age, your muscles tighten and they shorten. This results in severely decreased flexibility. Regularly stretching your back is one of the few ways to reverse this effect of aging. Does flexibility really matter? Absolutely. Stiffer, shorter muscles are harder to move. This results in much slower movements. It also increases the likelihood of suffering from a strain-related injury. Increased flexibility also makes it easier to exercise and increase strength, this is one of the reasons why you should always stretch before exercising. Here are a few more benefits that come from using an anti-gravity back stretching device. First, it will improve your posture. You probably heard teachers and parents emphasizing the importance of posture when you were young. That’s because it has a big impact on muscles later in life. Good posture can prevent severe neck and back pain. One final benefit is that it will simply improve your functionality on the day-to-day. This is sort of culmination of the other benefits. With increased strength, posture, and flexibility you will find it easier to perform many simple tasks. Whether its lifting a box, holding your child, or mowing the grass. All of these activities are improved by stretching your back. The Magic Back Stretcher is a device also referred to as an anti-gravity stretcher. It will help you properly stretch your upper and lower back. As a result, you experience improved posture, strength, and flexibility. ♦ Magic Back Support is designed to last, using thick high-tech ABS plastic for durability and longevity. 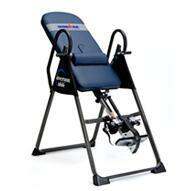 ♦ Adjustable lumbar stretchers are safer than inversion tables, and more effective than foam back stretchers. ♦ The curved portion of the device bends and varies from 11/2 inches at the base to 21/4 inches at the top of the curved. This device works with the natural curvature of the back to deliver optimal results. It delivers better results than simply stretching with no assistance. It even delivers better results than stretching with an exercise ball. This particular model comes with some educational material to help you better understand how it works. It includes directions, a DVD, a chair strap, and a massage top. If the benefits covered earlier sound important to you, then the Magic Back Stretcher is one of the best investments you can make right now. It’s not padded and your back WILL hurt after lying on this thing for 5 mins or more. If you purchase one be sure to use a thin pad of some sort or your back will feel like it was used for batting practice. But, it does seem to work pretty well for stretching / decompression. Surprisingly helpful simple device! After reading the above reviews you’ll have a better idea of which back stretcher is going to meet your personal needs and requirements. Depending on your level of fitness you’ll be able to select the one that works best for you. If you have plenty of upper arm strength you may wish to opt for the Hang Upside Down Model that mounts to a door frame. While this is easy to use, many won’t have the strength to attach the boots and pull themselves up the door frame with their arm strength. For those who just don’t have the strength, choose the table model where you actually lie down on the table. In this condition, the Ironman Inverter Back Stretcher Table is great to choose. The table model works very well for those who are at a lower level of fitness and who may have other health issues. It’s quick and easy to use and you don’t have to use any specialized footwear to use this model. Both models are comparatively priced and very affordable. Many chiropractor use both models. If your chiropractor uses one or the other they may be willing to allow you to try both models to see which one you’re more comfortable with. Focusing on a healthy back can greatly reduce back pain in both the upper and lower back areas. It can also reduce leg pain and knee pain as it will help to decompress the vertebrae that put pressure on the nerves. Your back health is as important as the rest of your health. A healthy back can help you to feel better, stand taller and have more stamina.